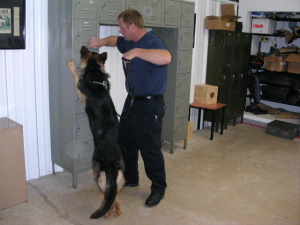 Commonly referred to as “Drug Dogs,” narcotic detector dogs trained by Little Rock K-9 Academy are enthusiastic, energetic working dogs, that are trained to actively seek out the odor of illicit narcotics or firearms. Our dogs are positively reinforced by the presentation of a play toy such as a ball or towel tug. Upon detecting the desired odor, the dog is presented his toy and that creates a very exciting and positive experience for the dog. All of our dogs are trained in advance and are tested for certification before they are ready to sell. 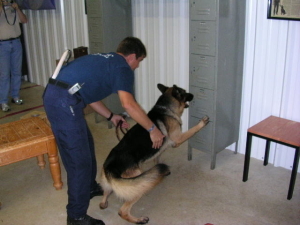 Our dogs are trained to detect the following odors: Marijuana, Cocaine, Heroin, Methamphetamine and optional odors such as: LSD, Ecstacy, Xanax and Firearms. We train both Passive and Aggressive indicating dogs. K-9 First Aid and C.P.R.